I enclose two pictures, one with and one without Jauntys wooden canopy. She is being repainted and varnished at the moment, but I will get you some pictures of the boiler and steam plant, when she is finished. 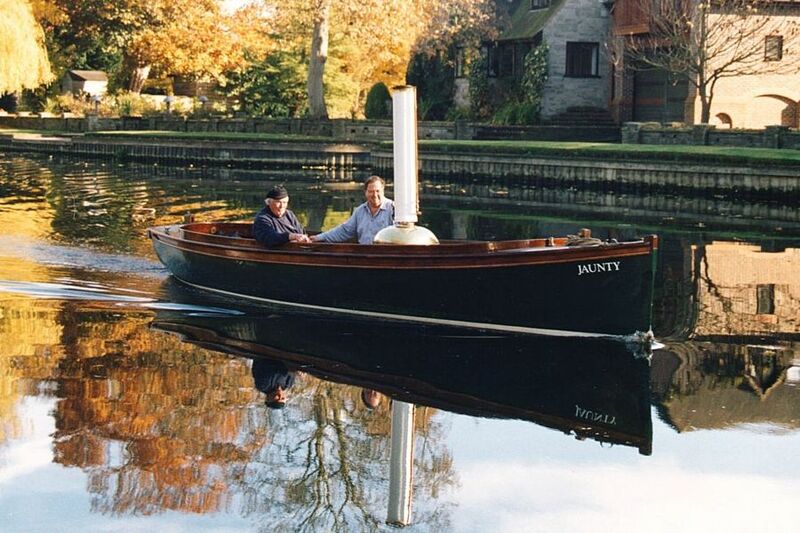 Jaunty was built by Phillip Guest , and Co of Fowey, Cornwall, UK in 1992 for her first owner John, who at that time ran a steam plant supply business: Precision Steam and fitted her out with one of his own boilers and a second hand engine. She is cold moulded triple diagonal mahogany, epoxy encapsulated. She has a modified Stuart 6A compound engine and a coal fired vertical water tube boiler with the pressure vessel replaced in 2000. In 1999 she was sold to Jim, who in turn sold her to me in 2003. After some very wet trips, we decided she definitely needed a canopy and John,a friend of mine, designed and built it for me. 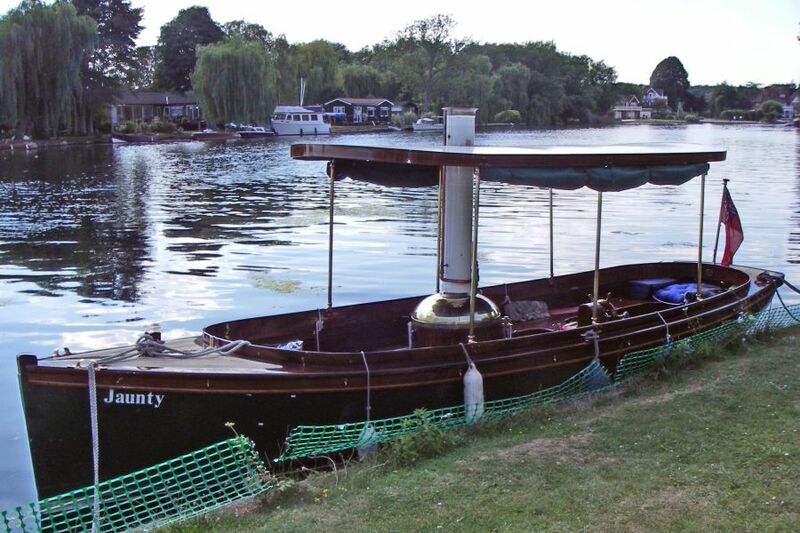 Jaunty is normally moored at Wargrave on Thames, although we tend to spend some time away on long trips or SBA rallies. Apparently Jaunty once acted as flagship for HRH Prince Andrew, The Duke of York at The Royal Dart regatta in her early days. My regular steam boating partner is Kenr: I provide the boat and he provides the engineering expertise. Until he retired last year, age 76, he was engineer at Freebody's boat yard and has restored the steam plant for a variety of craft including the passenger steamer 'Windsor Bell'.